Is there such a thing as telephone reluctance? I can tell you that when I was in the newspaper business, I would get in the car and drive across town to talk with someone face-to-face rather than take care of it in a five-minute telephone call. I communicate well in writing, and I communicate well face-to-face. The telephone (and its analogs like audio-only Skype calls) are my least favorite communication method. This is ironic considering the years I spent in radio–but that’s not two-way communication, so it sort of fits the pattern. For clarity: this is not the same as “sales reluctance,” which seems to equate to the fear of being turned down. 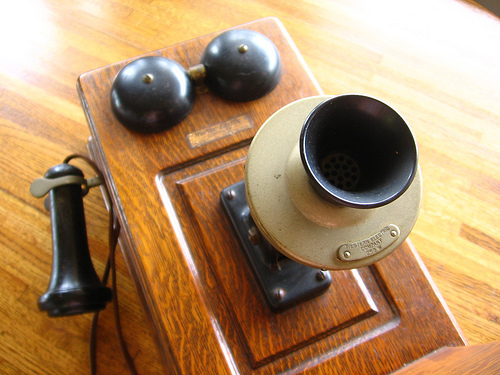 It is reluctance to make a simple connection via the telephone (and, by extension, any other audio-only two-way medium). I suspect that people with high visual learning styles experience it more than others, but I don’t have research to back that up. It can’t just be that, though, since 65% of learners prefer visual learning. (Plus, as we’ve suggested before, research indicates learning styles don’t really mean much.) It’s not physical presence alone, although I prefer that. I’m more comfortable with a video call (think Skype or Google Hangout) where I can see facial expressions, some body language, etc. There are certain other ironies around this. For one thing, although I prefer to see the other person, I’m a bit reluctant to conduct a video call from home. For reasons I won’t go into here, we live in a very cluttered house (it’s getting better, but we’re not “there” yet), and I hate for people to see that in the background. So I tend to wait to make such calls until I’m in my office. Maybe that’s a good thing–it helps to keep work time and personal time a little more divided. The irony I find most interesting, though, feeds into something that is both liberating and frightening to an academic. I know many of my colleagues worry about decreasing traditional literacy, and there are others who say that literacy is simply shifting. Even without a degree in anthropology, I think we can see this pattern across human history: the power of a written language was that it gave a way to preserve expression. That was a powerful tool in that it allowed both time-shifting and distance-shifting–someone could read an idea I expressed hours, days, or years after the original expression, and thousands of miles away. However, it only allowed connection via one of the three major channels of human communication: verbal (the words alone), devoid of the nuances given by paralanguage (the use of the voice) and nonverbal (the use of the body). That tool changed the course of human evolution, and was the sole tool for thousands of years (except for things like smoke signals), until in rapid succession we developed the telegraph (distance-shifting synchronous (and through printing, asynchronous) words), the telephone and radio (distance-shifting synchronous with paralanguage), recording (asynchronous distance-shifting with paralanguage), television (distance-shifting synchronous and asynchronous with paralanguage and nonverbal in one direction), etc. We have now reached a stage where we can easily create two-way video that encompasses asynchronous or synchronous full-spectrum interaction. Writing will survive since it remains cheaper and more permanent. But like all the others, writing is a technology. I think I’m comfortable with writing because it’s been around so long, it’s almost part of what it is to be human (I realize it’s still the blink of an eye in evolutionary terms). We have evolved conventions in writing that make up for the lack of paralanguage and body language. But those of us who have telephone reluctance deal with a simply biological urge: if I can hear you, I ought to be able to see you. If I can’t, it’s a bit dangerous. Fortunately, video communication such as Skype and Google Hangouts are taking us right past that. 500 years from now, I’m not sure historians will find much of a record we’ve left behind. Our communication tends to be so fast, so fleeting, that most of it doesn’t need preserving. In the rapidity of our communication, are we losing depth? On the other hand, does the immediacy of our communication means we can connect more thoroughly if we just understand this? What about you? Do you experience telephone reluctance to a degree? Has the availability of Skype, Google Hangouts, and other venues changed your experience? Photo by Flickr user TheLivingRoominKenmore.